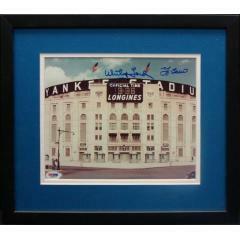 Here's a great piece of baseball memorabilia that every Yankees fan, as well as everyone who has an appreciation for the original "shrines" of the game, would love to have for their own. 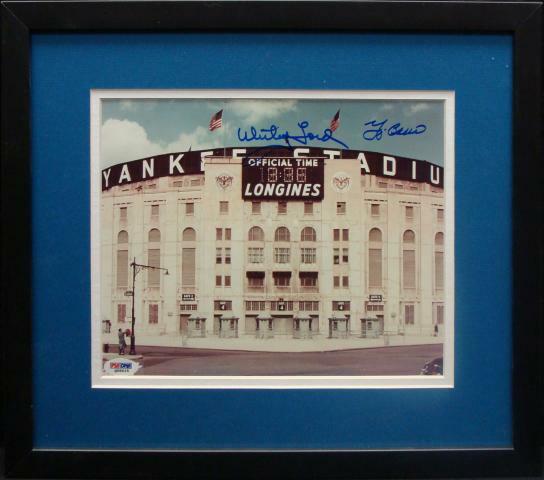 This is an absolutely beautiful 8x10 photograph of the original Yankee Stadium autographed by legendary Yankees battery mates White Ford & Yogi Berra. Professional matted and framed, this is fine historic photography that will look great on any wall ... anywhere. Authentication is included and provided by PSA/DNA. We have six, but these are priced to move and we don't expect to have them available for long. Buy yours today! Due to the rare nature of this item we will charge your credit card for the full amount immediately upon taking your order. This policy ensures we reserve the photo for you. We will confirm your order by Email. Please allow at least 2 weeks for delivery.